Find out more about our temple. The Hindu Temple Society of Mississippi (HTSM) was first established in 1986 for the preservation of Sanatana Dharma, commonly known as Hinduism. Hinduism, a Henotheistic religion with origins in the Indian subcontinent, is the oldest major religion and is practiced by 14% of the world population today. It is a way of life defined by two categories of texts: The Shruti, which are of divine origin, and Smriti, which define the Hindu traditions. Although some Hindus immigrated to North America at the turn of the previous century, most of the migration from India into the United States began during the second half of the last century after India gained independence from the British Raj. Today, Hindus comprise less than 0.9% of the US population. The Hindu Diaspora in Mississippi took root in the late 1960’s when numerous basic scientists moved into the state in order to teach at various universities. A wave of Hindu physicians moved into Mississippi starting early in the 1970’s, followed by businessmen who became more prominent in the mid to late 1980’s. The last major influx into Mississippi was by the IT professionals in the 1990’s. Upon this gradual convergence of different demographics, the Hindu population reached a critical mass leading to the construction of the first temple (located on the western end of the present temple). Due to the limited number of people involved, this early building was minimalist in shape and design. In later years, infused with manpower and monetary funds, the enthusiastic Mississippi Hindus formed a committee for the task of constructing the first authentic Hindu Temple in Mississippi along the strict codes of Vaastu Shastra (rules which guide the dimension, proportion, and orientation of the physical structure). 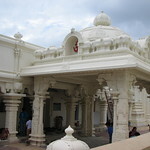 As a result of the dedication and diligence of the entire Hindu community of Mississippi, artisans from India, and local contractors, the temple structure was completed and consecrated and the present Hindu temple became fully operational on Monday, July 12, 2010. In Sanatana Dharma, a temple represents an architectural attempt to bind the natural physical world with the inner world of the eternal Self. The main temple structure itself houses multiple Garbhalayas or Inner Sancta for the various deities and each cubical Garbhalaya may also be called an individual temple. There is a great deal of architectural variation among the Hindu temples of India that may be categorized not only by region but also by historical era. An astute observer, versed in the Vaastu Shastra and history of Hindu Temple architecture, can easily identify a particular style by paying close attention to the Vimanam (the roof of each Sanctum that projects through the larger roof of the main temple building) and the Raj-Gopuram (the highest decorative monumental tower in the eastern side). An additional unique aspect of the Hindu Temple on Vernon Jones Avenue—besides being the only authentic Hindu Temple in our state—is the floor design layout depicting the history of our cosmos as we understand it today. This particular geometric layout cannot be found in any other Hindu Temple. Our Hindu temple services include celebration of major festivals, regular services performed by the priests for various deities, and individualized services through special appointments with the temple priests. Because of the inherent nature of our Hindu temple services that have been preserved through ancient times, no description can do justice to having an actual personal experience of such a service. It is believed that a mere sight of a temple, even from a distance, can be a divine experience in itself. 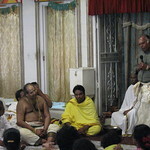 Entering a Hindu temple for devotion under the guidance of the priest may even be a life altering spiritual experience. You are welcome to visit our temple during normal temple hours.